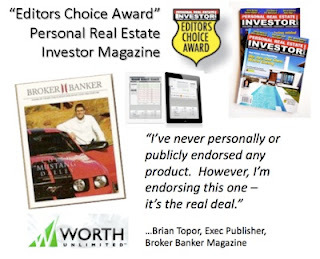 The early beginnings of Worth Unlimited shows a history of stewardship and care for others and, now, this all new program takes technology and financial management to the next level, winning awards and over 70,000 clients, to date. Friends since childhood, they learned what debt can do to a family when both their families lost their homes to foreclosure and they had to move. That helped the two to develop a tremendous dislike of debt and a passion for helping others to avoid it. As young adults, the two friends went into business together, opening a mortgage company with the vision of helping young families, like each of theirs, get a start in life. 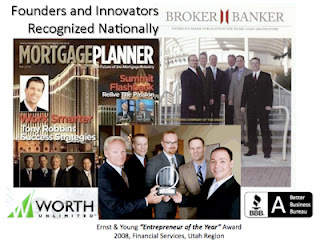 Within three years, their mortgage company “Accelerated Equity” had distinguished itself as one of the fastest growing mortgage companies in Utah. However, Skyler and John were not achieving the complete vision they had hoped for. Despite coaching clients with financial strategies to help their clients get out of debt and pay off their homes early, they watched in dismay as clients came back to them to refinance over, and over again – generally to cover expanding consumer and credit card debt. Additionally Skyler and John watched in dismay as the national trends toward ever expanding personal debt meant that more and more people were living paycheck to paycheck, less American's had any personal savings or retirement plan and more and more families were facing financial challenges. With average personal debt exceeding over $43,874 per person, and with financial stress quoted as being one of the leading causes of divorce, Skyler and John saw this as being the single greatest threat to the American family. ~~ They knew there had to be a BETTER way. More than just a financial one, this became a moral mission. They went on a quest to find a way to help clients to be more successful with managing their finances, looking for financial tools that could help as well. With mortgages being the single biggest debt most of us will ever have, they focused their research there. In doing so they learned about the “offset mortgages” being used in Australia and the U.K. (now, offset mortgages make up the majority of mortgages in those countries), and they recognized that – mathematically at least – the offset mortgage was vastly superior to the amortized mortgages we have here in the United States. They also could see there were two problems to be faced. One was… we didn’t HAVE those mortgages here in the U.S. and the second, biggest problem, even if we did, without good financial discipline, an offset mortage loses it’s financial advantage. But John, being a self-professed “math geek” (he also shares credit with Skyler’s wife), went about designing a software program that would allow the user to mimic the mathmatical advantages of the offset mortgage, but with psychological tools built into it that make it easy for clients to be more financially disciplined and motivated. Thus, what was then called, “The Money Merge Account” was born in 2004. 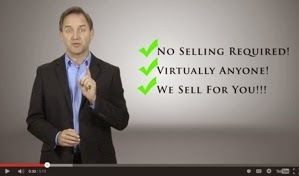 Marketing it under the name United First Financial, the company did a “test run” with 400 clients in the Colorado and Utah area and discovered amazing results. Not only were clients “sticking to” the program (over 95% still using the program regularly 4 years out), but the average client was achieving 20% BETTER savings than was projected for them (with their free Savings Analysis) when they got on the program! All debt paid off, credit cards, car loans, student debt, etc. Amortized, that's over $900 in interest savings for each month of program use. The first version of the program utilized a HELOC (home equity line of credit) in order to mimic the offset mortgages math advantage. Other debt got paid off by rolling it into the equity line (also producing tax advantages). However, while the program got great results, saving (on average) more than 15-20 years on a 30 year mortgage, Skyler and John had an even bigger vision for the program. Superior features have been added to the Worth Account, making the program a great tool, not just for personal finance – but also for BUSINESS finance. Reporting features allow a client to manage both the finances of their business or organization, and their personal finances too – yet print out separate reports at year-end for tax purposes. Cloud based integration with over 13,000 banking institutions means users can also pull all their accounts into one “dashboard” and sync right with their accounts for purposes of automatic updating. 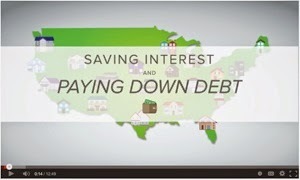 There is all new PROGRAMMING for debt payoff as well. The best way to describe it is like a “GPS” system – but for your finances. Pulling all your information on various debts, interest rates, payment amounts, income frequency and amounts into one “financial brain” – the program uses factorial math algorithms to calculate the quickest way to zero debt, paying the least in interest. Additionally it suggests movements of money from one account to another in order to manipulate the interest paid to YOUR advantage. No longer does the program need a line of credit to operate, 95% of customers are activating it using just the accounts they already have in place (though adding a line of credit down the road, will add a mathmatical savings advantage). Best of all, there's a whole new pricing structure based on how much the program saves. There are THREE versions of the program... Consumer Debt (no mortgages), Homeowners (1-2 mortgages) and Investor (3 or more mortgages), and each is priced differently and "capped" - meaning clients never pay more than about 3% of their projected, guaranteed savings, but could also pay as low as 1/2 of 1%. Would YOU invest $3 if you knew you'd be guaranteed to save $100? Would you invest 50 cents? A tool + income! Our all new “Refer & Earn” marketing program rewards clients when they refer others, allowing them to earn referral “commissions” by simply recommending a friend get a FREE Savings Analysis. This means you could easily earn more in referral fees than your investment in the program cost you – making your program virtually free! Now Worth Unlimited is able to place in a clients hands not only a tool to make it easy for them to reach their financial goals... but also an additional source of revenue (that requires very little effort) to help them reach those goals even faster! ~~ Are YOU debt free? Good stewardship of money starts at home. Is YOUR house paid for? The best way to really understand how truly powerful this program is, is to see YOUR own numbers in black and white. See when you can be completely debt free... withOUT changing your budget. A FREE Savings Analysis takes just 5 to 10 minutes. No "personal" info is needed for this confidential analysis... only the balances, interest rates, and payment amounts for your debts, along with an idea of income. The savings results are tied to the GUARANTEE. Our average client is saving over $120,000 and paying off a 30 year mortgage (and ALL debt) in just 7-11 years. Your savings might be a bit less, or more, but it only takes a few minutes to find out. ~~ Marketing made easy… and FREE! Are you a professionals or business owner? This is a program YOU can refer clients and friends to. The Worth Account is a perfect "value added" service you can tell clients about - simply directing them to a free Savings Analysis. You never "sell" the program, simply refer. For you, it's a way to insure your client base is more credit-worthy and financially sound. 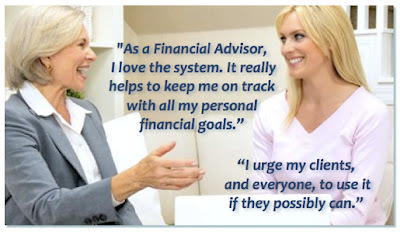 For your clients... it’s a BETTER way to get ahead financially… no books to read, no spread sheets to fuss with... just a simple and easy program to follow... a way that will strengthen families and solidify financial futures. ~~ Referring to Worth Unlimited is EASY!